Buying quality stocks with high dividend yields can produce excellent returns to investors. Buying quality dividend stocks when they are undervalued, is even better. The combination of a high dividend yield and low stock valuation can make for an investment that significantly outperforms the S&P 500 Index over time. Of course, investors must find stocks that are only temporarily undervalued. Investing in turnarounds requires identifying companies that can successfully return to growth in the years ahead. ABB Ltd. (ABB) is certainly a beaten-down value stock. The stock is down roughly 20% in the past 12 months. While the stock has struggled, a successful turnaround has put it in position to return to growth. In the meantime, investors have a potential buying opportunity through the low P/E ratio and high dividend yield of the stock. 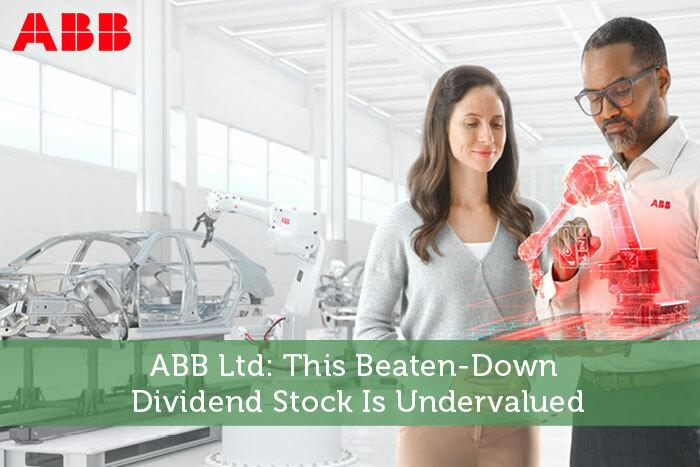 Because ABB has appeal on a value and income basis, it is one of the top industrial dividend stocks today. ABB might not be a well-known company to U.S. investors, but it has a long history of growth. ABB’s history stretches back over a century. ABB, in its current form, is the product of several mergers, most importantly the 1988 merger of ASEA and BBC (formerly known as Brown Boveri), two of the largest companies in European electrical engineering. Today, ABB is a technology leader in its four key operating areas: Power Grids (soon to be divested), Electrification Products, Industrial Automation, and Robotics & Motion. The company generates annual revenue above $34 billion, and serves a range of customers across the utility, industrial, transport and infrastructure industries. The past year has not been positive for ABB. The stock has declined 20% in the past 12 months, as investor sentiment has deteriorated due to global trade concerns. But the company has employed a number of initiatives to accelerate growth in the years ahead. In December 2018 ABB announced the sale of its Power Grids business to Hitachi for an overall enterprise value of $11 billion. ABB will initially retain a 19.9% equity stake in the business to ensure a smooth transition. The transaction is expected to close by the first half of 2020. ABB intends to return 100% of the estimated net cash proceeds of $7.7 billion to shareholders, primarily through share buybacks or a similar cash return. Another turnaround initiative is cost-cutting. In 2017 the company completed its 1,000-day productivity program, which resulted in annualized cost savings of more than $1.3 billion. More recently, ABB is considering additional cost-reductions measures that could produce $500 million in added cost savings through restructuring at both corporate and regional offices. These efforts are starting to bear fruit. In late February, ABB reported financial results for the fourth quarter and full-year for fiscal 2018. Comparable revenue increased 5% in the fourth quarter, and 4% for the full year. In 2018, the company grew its orders by 8%, with order growth in all divisions and regions. It also grew revenue by 4% thanks to strong performance in Robotics & Motion and Industrial Automation. The company’ backlog increased 6% over the prior year while operational earnings-per-share increased 8% on a constant-currency basis for 2018. ABB’s steady earnings growth allows the company to invest in growth, and return cash to shareholders through dividend increases. The company has raised its dividend for 10 years in a row. And with a projected payout ratio of 53% for 2019, ABB has the financial flexibility to continue raising the dividend each year moving forward. ABB’s growth is fueled by its competitive advantage. Its various operating divisions are either #1 or #2 globally in their respective markets. ABB enjoys operational efficiencies and the ability to cut costs to drive earnings growth. Broadly, the markets in which ABB operates have a positive growth outlook. The company expects its business markets to grow by 3%-4% per year over the long-term. Thanks to its dominant position across its core product segments, ABB enjoys a significant competitive advantage over its peer group. As an industrial, ABB would be negatively impacted by a global recession. Therefore, investors should not view ABB as a recession-resistant company. But as long as a global recession does not occur in the near future, ABB should continue to drive EPS growth. As a global industrial, the company’s financial performance tends to mirror global economic conditions. ABB itself remains cautiously optimistic about the global economic outlook. While macroeconomic conditions are mixed in Europe, the U.S. remains a growing market. And, ABB has exposure to higher-growth emerging markets such as China, where the company expects growth to continue in the near term. As long as ABB’s turnaround remains on track, the stock appears to be significantly undervalued today after its 20% decline in the previous year. The company is expected to generate earnings per share of $1.50 in 2019. Based on this, the stock is currently trading at a price-to-earnings ratio of 12.5, which is a fairly low valuation for a highly profitable company. A more reasonable estimate of fair value for ABB stock could be a P/E ratio of 16, considering the company’ future growth potential. As a result, expansion of the P/E ratio from 12.5 to 16 could boost returns to shareholders by 5% per year over the next five years. In addition, shareholder returns will be generated by EPS growth and dividends. EPS is estimated in the range of 6% per year over the next five years. Lastly, ABB has an annual dividend payout of $0.80 per share, which results in an after-tax dividend yield of 2.8%. Switzerland imposes a 35% dividend withholding tax. Excluding the withholding tax, the dividend yield would be 4.3%. Still, an after-tax yield of 2.8% beats the 2% average yield of the S&P 500 Index. The combination of valuation changes, earnings growth, and dividends results in expected total returns of nearly 14% per year over the next five years. An expected rate of return of 14% is very attractive to many types of investors, particularly value and income investors. ABB stock is an appealing combination of growth, value, and income. As long as the company continues to execute on its new strategic direction, the current share price level could be viewed as a buying opportunity.